Bury manager David Flitcroft described his side's football as "breathtaking" as they beat previous leaders Burton Albion to go top of League Two. The Shakers moved into first after two goals from Daniel Nardiello and another from Ryan Lowe sealed a 3-1 win. 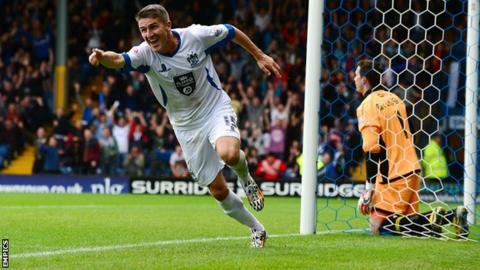 After losing their opening game of the season to Cheltenham, Bury are unbeaten in eight games, winning six of those. "The football displayed was breathtaking and completely disruptive at times," said Flitcroft. "People talk about winning but if you look at the performance, and as a coach or manager you concentrate on the performance, the wins come." A number of players joined Bury from higher divisions during the summer, including Kelvin Etuhu and Nicky Adams, leading some bookmakers to make Flitcroft's side favourites for promotion. "It's always about the team. I can't stand individuals in a team sport," he told BBC Radio Manchester. "I always say to the players that if they want to be an individual, they should take up tennis or golf. When you're a part of a team, and a special team, then you've got to make sure you do everything out of possession and in possession. "In the second half, once we'd scored and opened them up, it was just a blitz. Every time we went forward, we looked like we'd score." Flitcroft, who played from Bury between 2004 and 2006, became the club's manager in December 2013 following his departure from Barnsley and has transformed the squad he inherited. "I've said to the chairman that we'll get up there, we'll play the right brand of football, but we can't wait to build it and see if they will come," added Flitcroft. "We've got to go out there in the town and get people energised by what they see. I think once they come into the stadium and see the football we're trying to play, they'll want to be a part of it. "The identity has been found. We're engaging again with the town and the fans and that is key."